Collins was part of the Californian and Merle Haggard in the '60s, a the slick country music that was ram Parsons and the cosmic country pitied his style, an everyman brand and one liners that could be heard stic situations. 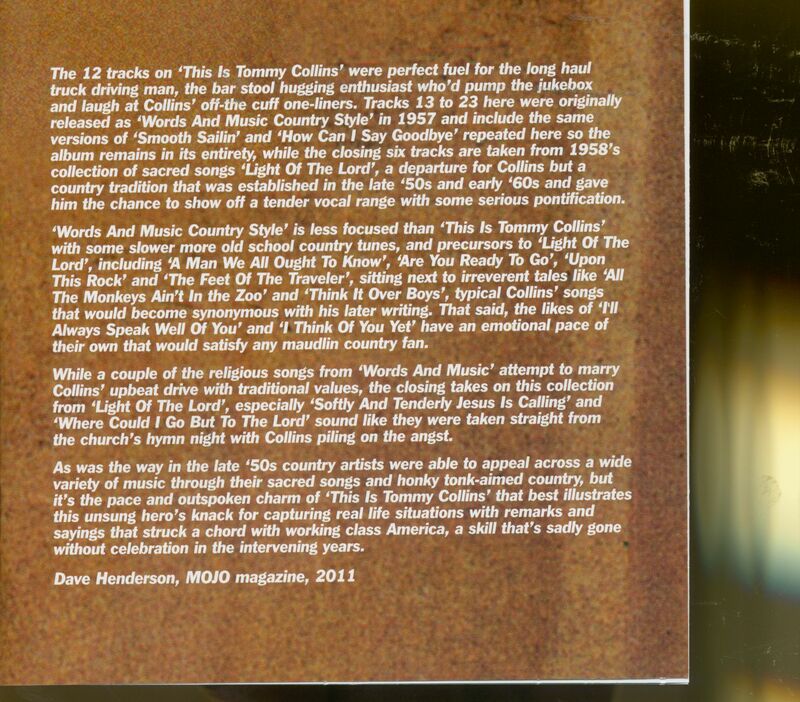 Love for Collins, who write hits for Faron Young and it was chirpy and irreverent for needed to be. 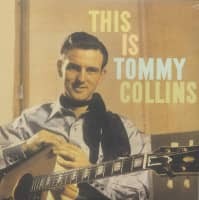 The 12 tracks on 'This Is Tommy Collins' were perfect fuel for the long haul truck driving man, the bar stool hugging enthusiast who'd pump the jukebox and laugh at Collins' off-the cuff one-liners. Tracks 13 to 23 here were originally released as 'Words And Music Country Style' in 1957 and include the same versions of 'Smooth Sailin' and 'How Can I Say Goodbye' repeated here so the album remains in its entirety, while the closing six tracks are taken from 1958's collection of sacred songs tight Of The Lord', a departure for Collins but a country tradition that was established in the late '50s and early '60s and gave him the chance to show off a tender vocal range with some serious pontification. 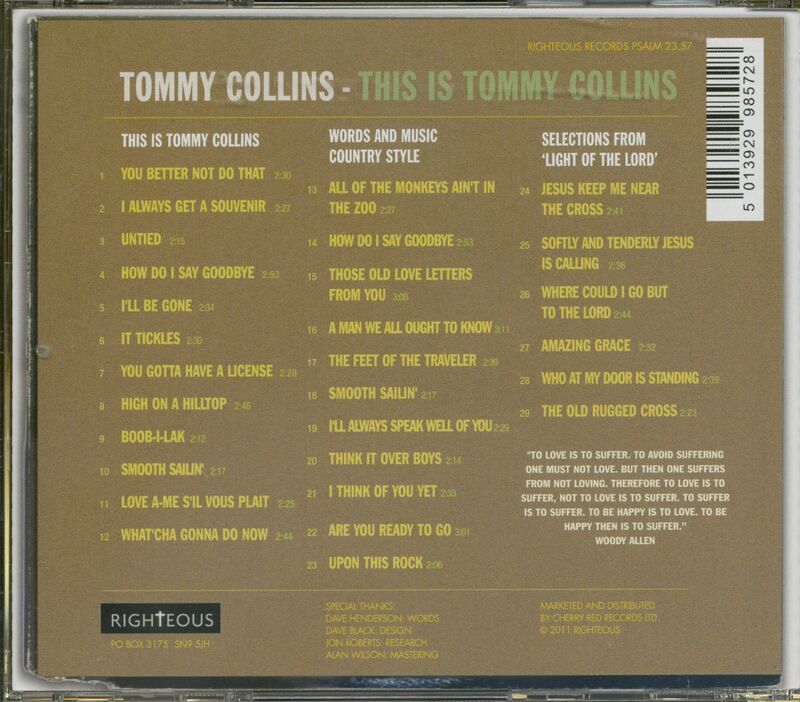 'Words And Music Country Style' is less focused than 'This Is Tommy Collins' with some slower more old school country tunes, and precursors to 'Light Of The Lord', including 'A Man We All Ought To Know', 'Are You Ready To Go', 'Upon This Rock' and 'The Feet Of The Traveler', sitting next to irreverent tales like 'All The Monkeys Ain't In the Zoo' and 'Think It Over Boys', typical Collins' songs that would become synonymous with his later writing. That said, the likes of Always Speak Well Of You' and 'I Think Of You Yet' have an emotional pace of their own that would satisfy any maudlin country fan. While a couple of the religious songs from 'Words And Music' attempt to marry Collins' upbeat drive with traditional values, the closing takes on this collection from 'Light Of The Lord', especially 'Softly And Tenderly Jesus Is Calling' and 'Where Could I Go But To The Lord' sound like they were taken straight from the church's hymn night with Collins piling on the angst. 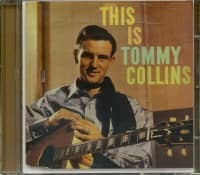 As was the way in the late '50s country artists were able to appeal across a wide variety of music through their sacred songs and honky tonk-aimed country, but it's the pace and outspoken charm of 'This Is Tommy Collins' that best illustrates this unsung hero's knack for capturing real life situations with remarks and sayings that struck a chord with working class America, a skill that's sadly gone without celebration in the intervening years. The recent death of Tommy Collins (March 14, 2000) was hardly unexpected because he had been ill with emphysema for a long time, but was sad nonetheless. Not long ago, in September 1999, he was admitted to the Nashville Songwriters Hall of Fame. Along with his contemporary Wynn Stewart, Tommy Collins was one of the first country musicians to establish the Bakersfield Sound. Legions of West Coast country performers built on the sound that Collins established in the early '50s. Although his hits were relatively few in number, his influence loomed large. Collins (Leonard Raymond Sipes) was born just outside of Oklahoma City, spending his entire childhood in Oklahoma. As a child, he began to sing and write songs, eventually appearing on local radio shows. During his time at the College, he continued to perform and made a handful of singles for the Morgan label. In the early '50s, he was in the army for a brief time, before he moved to Bakersfield, California. Collins became friends with Ferlin Husky. Husky convinced his record company, Capitol, to offer Tommy a record contract. 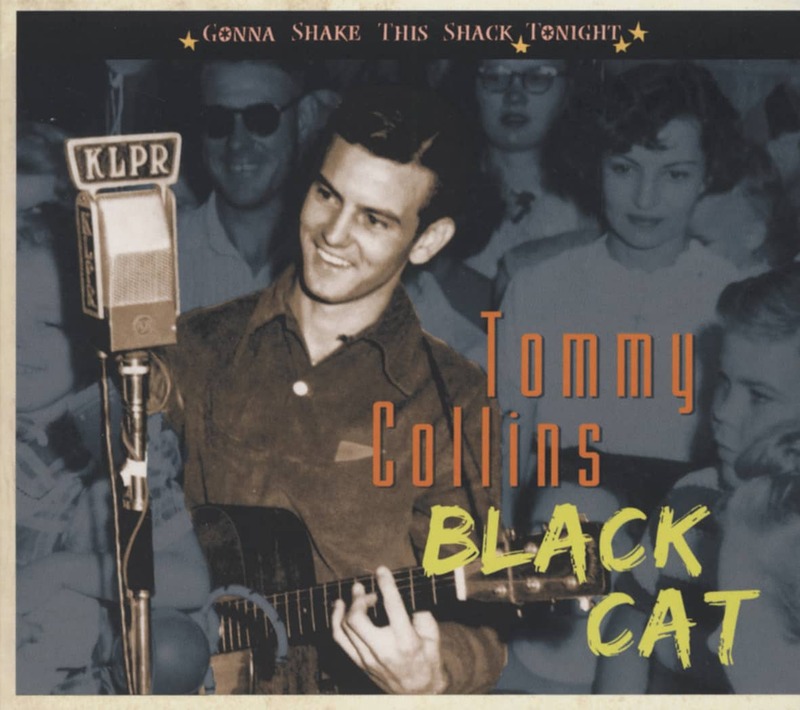 At the time of signing, in June 1953, he adopted his stage-name of Tommy Collins. Following one unsuccessful single, Collins' released the jaunty You Better Not Do That, which became a huge hit in early 1954. 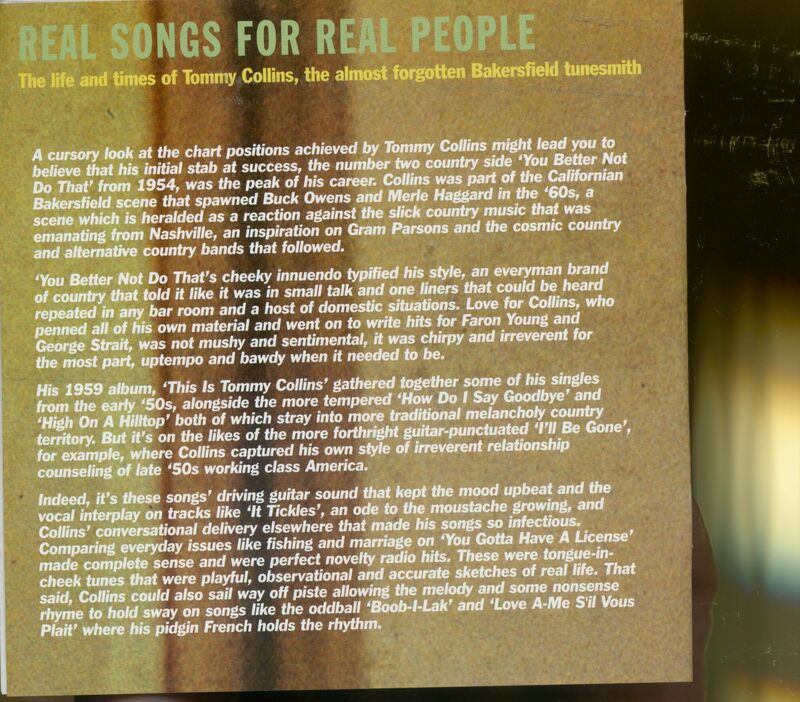 Since the song was a success, Collins continued to pursue a light-hearted, near-novelty direction. Between the fall of 1954 and the spring of 1955, he had three Top 10 hits -- Whatcha Gonna Do Now, Untied, It Tickles -- and in the fall of 1955 I Guess I'm Crazy and You Oughta See Pickles Now both reached the Top 15. 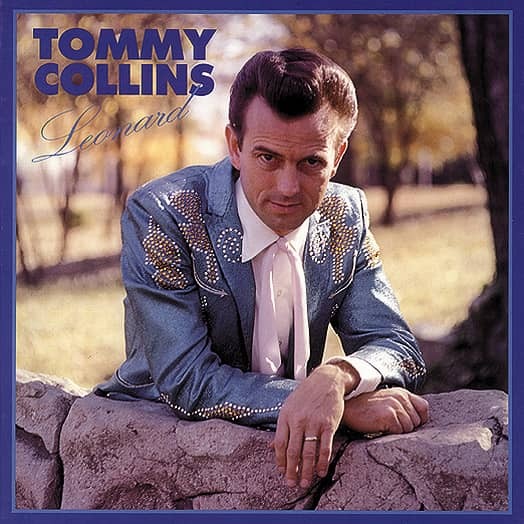 In addition, Faron Young had a huge hit with Tommy's If You Ain't Lovin', which was one of many songs that Collins wrote but didn't record. 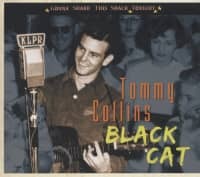 Tommy Collins seemed to be on the fast track to major success, but it stopped just as soon as it began. He had a religious conversion in early 1956. For the following six years not much was heard from him in the field of music. In early 1963, Collins left the church and headed back to Bakersfield. Capitol agreed to re-sign him and in 1964, he returned to the charts with I Can Do That, a duet with his wife Wanda Lucille Shahan. Collins switched labels and signed with Columbia in 1965; the following year, he had a Top 10 hit with I Can't Bite, Don't Growl. For the next few years, he had a string of hit singles. By the early '70s, Collins' professional and personal lives were on the verge of collapse, due to his increasing dependency on drugs and alcohol. In 1971, Wanda filed for a divorce, sending Tommy into a deep depression. Collins began to recover by continuing to write songs, many of which were recorded by Merle Haggard, including the '70s hits Carolyn and The Roots Of My Raising. In 1981, Merle Haggard had a hit single with Leonard, his tribute to Collins. After the release of Leonard, the spotlight again turned to Collins, who was now sober. 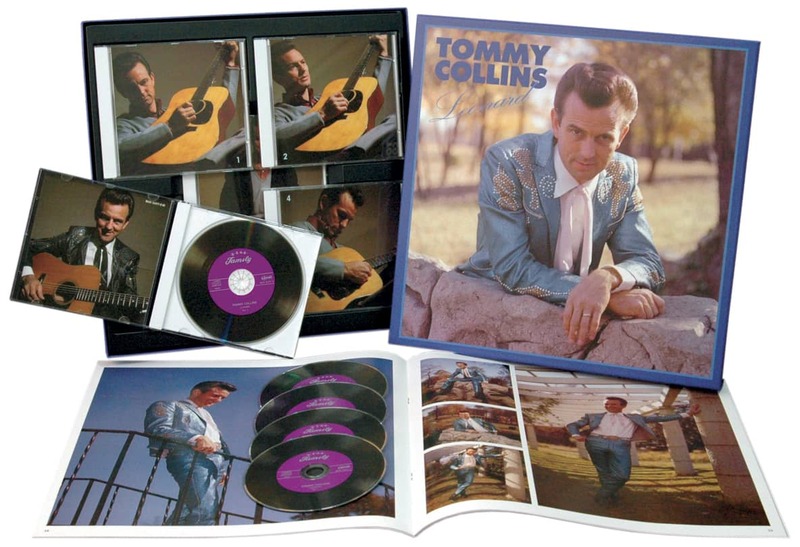 Tommy resumed professional songwriting and his most notable success was Mel Tillis' Top 10 1984 hit, New Patches. Throughout the '80s, Collins kept a low profile, though his songs continued to be recorded. George Strait took his new version of If You Ain't Lovin' to number one on the country charts. Collins continued to write songs throughout the mid-'90s. In 1992, Bear Family released a highly-praised 5-CD set, LEONARD (BCD 15577 EI), which included his complete Morgan, Capitol and Columbia recordings. 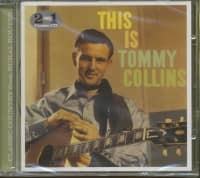 Customer evaluation for "This Is Tommy Collins (CD)"